Ryland Adams is one of YouTube’s most prominent creators, best known for his collaborative work with boyfriend Shane Dawson and his time as a host on Clevver, a YouTube channel owned by a multi-channel network called Defy Media. He’s made a name and living for himself through his YouTube career and network partnership, but with that partnership now collapsing, he’s still owed large sums of money. Now that Defy has shut down operations, he has no idea if he’ll ever get paid. Adams is also one of many prominent YouTube creators who has spoken out against Defy Media, a production company and multi-channel network (or MCN) that oversaw dozens of popular YouTube channels. The company oversaw more than 50 YouTube creators and channels, many with more than 1 million subscribers who garnered tens of millions of views each month. Many of these videos included sponsorships from companies, and numerous ad placements, generating hundreds of thousands of dollars in revenue. At its peak, the company reported nearly 400 employees, but on November 6th, the company ceased operations and laid off its workforce, according to a report from Variety. That’s left creators like Adams in the cold, often with hundreds of thousands of dollars suddenly missing. Networks like Defy work as a kind of collective talent agency for YouTube creators, securing ad deals and sponsorships with major companies for specific channels. A percentage of the AdSense revenue made on a video would also go to the network. It’s a common practice for networks that work with YouTube creators, but a potentially dangerous one when the network falls on hard times. When Defy shut down, creators stopped getting checks and were left with no clear path to recover outstanding debts. Communication has essentially ceased between creators and executives at the company, according to multiple published testimonials on YouTube. Any money owed to creators, ranging from a few thousand dollars to significant sums, has seemingly disappeared. Anthony Padilla is another one of those creators — and perhaps one of the most prominent YouTubers involved with Defy. Padilla is the co-creator of Smosh, the 43rd biggest YouTube channel with more than 22 million subscribers. Padilla and co-creator Ian Hecox decided to sell Smosh to a company that would eventually become Defy Media in 2011. Padilla and Hecox received stock in the company in return that they could then cash out when the company went public. That never happened. Padilla acknowledged they were given salaries by Defy Media, but reiterated that both he and Hecox only saw a fraction of the “millions of dollars” the company was pulling in. He, like other creators who have voiced their frustrations, are mostly confused about where that income and an additional $70 million in funding went. Other revenue plays, including an Indiegogo campaign for a video game that raised more than $250,000, were just as mismanaged by the company, according to Padilla. Adams’ comments echo numerous lawsuits filed against Defy Media this year, including complaints from smaller production companies that Defy Media withheld revenue made through advertising partnerships. Shandy Media, which runs three YouTube channels with more than 2.5 million subscribers across the channels, filed a lawsuit in June claiming a breach of contract over an advertising deal, ultimately costing the channels more than $100,000. A separate lawsuit filed by ViewAll Investments, a media publishing, and ad platform, complained that Defy Media failed to pay invoices. A third issued by talent manager David Rath suggested that Defy Media purposely hid its financial woes, misleading individuals and companies entering into partnerships with Defy. Defy Media is also facing a class-action lawsuit from Georgie Guinane, a former writer, and producer for Defy’s Clevver property, arguing the company has violated federal labor law by giving laid-off employees insufficient notice of termination. Part of the problem is a broader shift away from multi-channel networks on YouTube. Networks became an attractive option for creators a few years ago when YouTubers were concerned about the frailty of Google’s AdSense system. Some creators who were receiving AdSense revenue from YouTube’s Partner Program were seemingly released from the network, and that caused widespread panic. Multi-channel networks acted as a safe harbor: the company protected the creator from copyright infringement issues or other possible hurdles, and guaranteed a YouTuber would receive ads on their videos. But earlier this year, creators started running into issues. In the wake of Logan Paul’s Aokigahara Forest scandal, YouTube decided to remove a creator tier known as “managed partners,” which let networks run ads on videos instead of forcing creators to go through YouTube’s Partner Program on their own. As a result, creators who worked with an MCN to receive AdSense revenue had to reapply through YouTube’s Partner Program in order to run ads on their channels. If networks couldn’t place ads on videos or produce sponsorship deals, then there was no advantage to joining a company like Defy. Creators would be giving away a percentage of their profits without any promised revenue in return. Multi-channel networks stopped being a safe haven for many creators, and everything they initially promised people stopped being a selling platform — including creators like Chris Stuckmann. Stuckmann is a popular YouTube commentator known for his film criticism and commentary. He signed with Defy Media’s MCN as a form of protection. Film criticism on YouTube is tricky because studios like Paramount and Universal have a history of issuing copyright infringement notices when any of their footage is used — even if it can be classified as Fair Use. Stuckmann thought it made the most sense, especially during one of YouTube’s most turbulent times. A number of networks were forced to end partnerships and relationships with creators following YouTube’s decision. 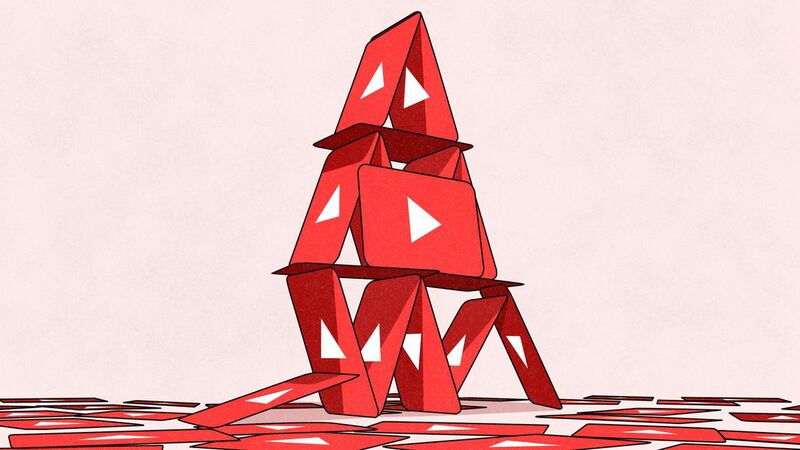 Jason Urgo, CEO of Social Blade, told Polygon earlier this year that networks couldn’t take on the overwhelming responsibility of watching every single video to ensure creators didn’t violate YouTube’s community guidelines. “[It] in effect forces MCNs to either watch every video uploaded by their partners, or at least be reasonably confident none of the videos they are uploading could possibly either in the present or in the future violate or even come close to violating a YouTube guideline/terms,” Urgo said. Defy Media was an exception, according to an executive at one multi-channel network, who asked to remain anonymous out of fear for his job security. The company secured $70 million of investment in 2016, but ran through it surprisingly quickly, which some put down to simple bad management. “I don’t think Defy fell victim,” the executive said. “Defy was one of the first few MCNs that worked with premium content creators. If you look at Defy’s contact list, they’ve got some pretty big names, they’ve got the big guys. Defy was never impacted by YouTube’s terms of service and changes. I think Defy was just poor executives and poor management that ran the company.”. Posted in Blog, News and tagged #1.2 million subscribers, #mcsc, #TheMessiah, #YouTube, Blindsided.